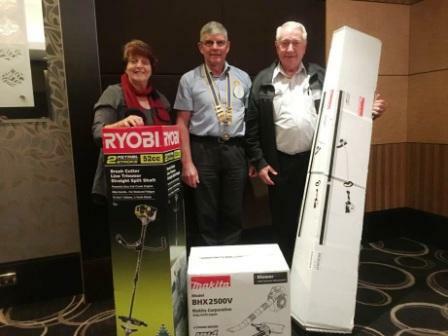 The Pine Rivers club combined with the Pine Rivers Daybreak Rotary club at a meeting on 21 August to finalise a grant to provide gardening equipment to Encircle at Lawnton. Chairman Gary introduced Jim Deutschmann , Encircle Coordinator who spoke of the activities and aims of the Encircle Group and his role as coordinator. Jim is a former Church of Christ pastor and, in his retirement, took on the role of gardener at the Lawnton Centre. The Centre has a community garden and a café and the aim is to support and feed the needy at least partially from the produce of the garden. In order to enhance their activities the group applied for support from our Club and Pine Rivers Daybreak. Trish, in cooperation with Pine Rivers Daybreak, applied for a District Grant and were successful. Consequently, the two Clubs were able to supply a number of items of equipment to Encircle. The items were:- Two Mowers, two brushcutters, a leaf blower and a greenhouse and shelving (the greenhouse will be used for plant propagation with excess plants for sale). Jim thanked our Clubs for making it possible for Encircle to provide a better service to the community. The brushcutters and the leaf blower were then presented to Jim.